On the eve of lunar new year, the Maritime and Port Authority of Singapore (MPA) release a media statement regarding 'Contact between vessels NYK Themis and AZ Fuzhou' - MPA News centre, 30 January 2014. A collision between the vessels happened at East Keppel Fairway at about 4 km south of Marina South. "NYK Themis" is a Panama-flagged containership while "AZ Fuzhou" is a barge being towed by "AZ Carnation". 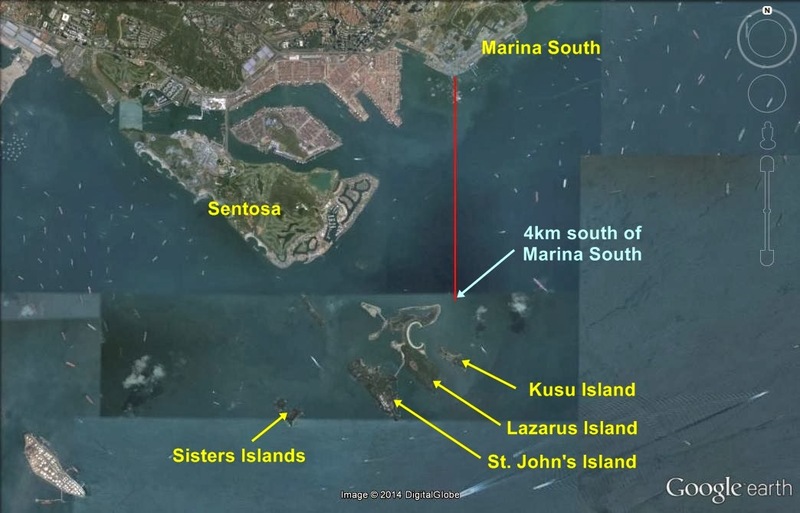 Here's a estimated location mapped out by Ria Tan (wildsingapore) to show collision spot. The collision caused damages on the bunker tank of "NYK Themis", resulting in some spillage of bunker fuel. 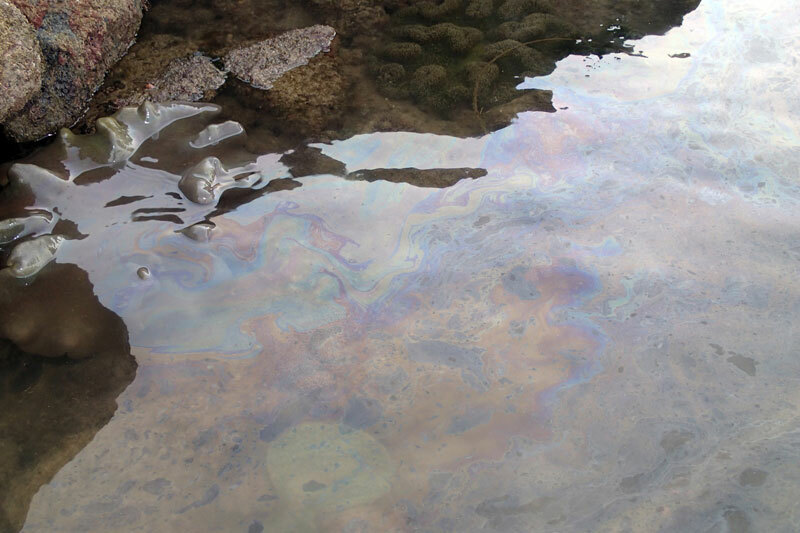 MPA's statement stated that "Oil spill response companies were also activiated to support the clean up efforts." It seems that some substantial amount of bunker oil escaped the clean up operations and floated towards the nearby southern islands such as Kusu, Lazarus and St. John's Island. 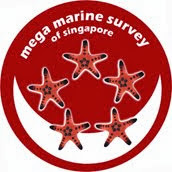 It was by chance that a few of us had arranged to survey the reef at Kusu Island on lunar new year. 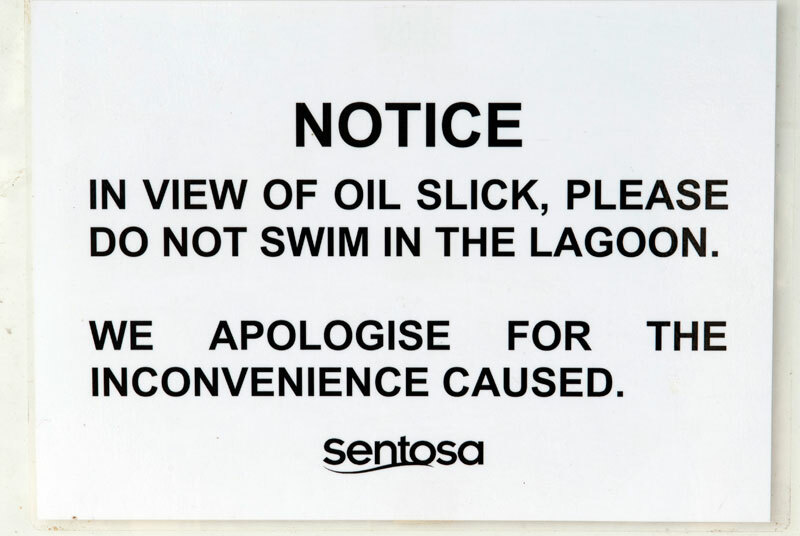 When we arrived at Kusu Island, there was already a signage put by Sentosa to warn people the presence of oil slicks in the big lagoon. Oil slick is a layer of oil floating on the surface of water. We were unaware of the extend of the oil spill impact on Kusu Island but immediately pass the island's ticketing counter, we were shocked at the sight. We could clearly see the oil marks on the inner left sea wall of the lagoon. 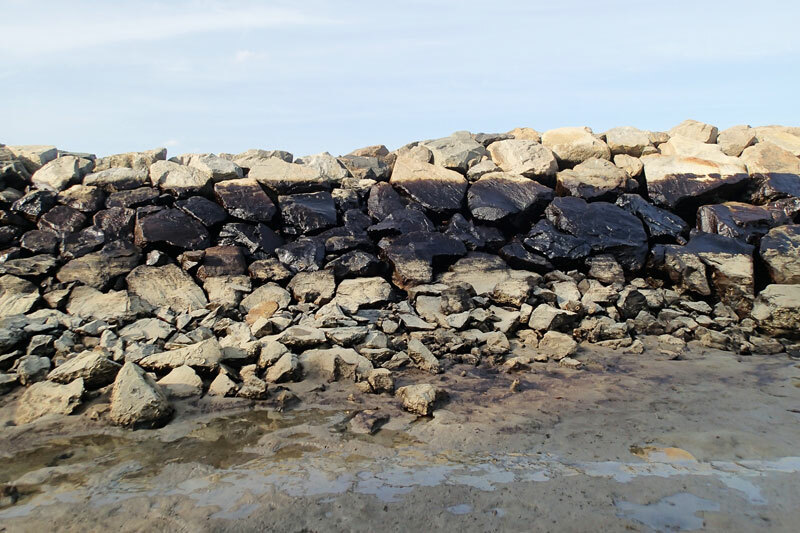 Thick layer of oil on the sea wall. 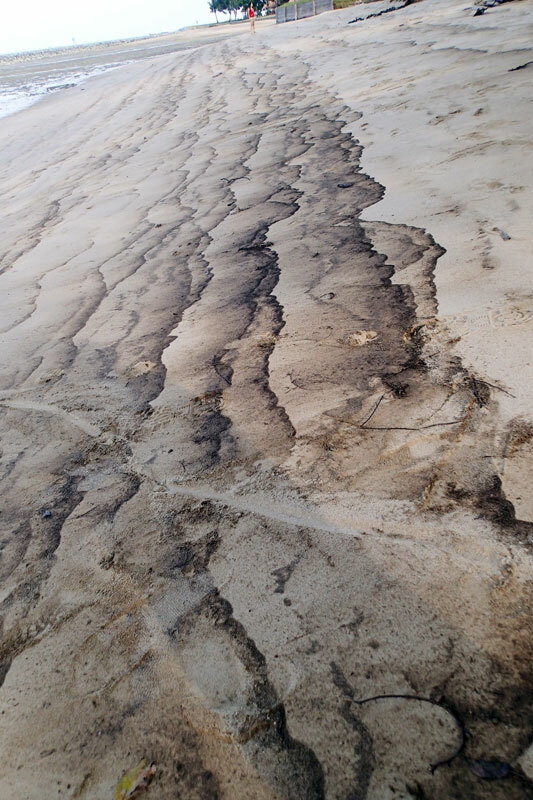 On the high shore, the oil slick left a trail along the whole beach. 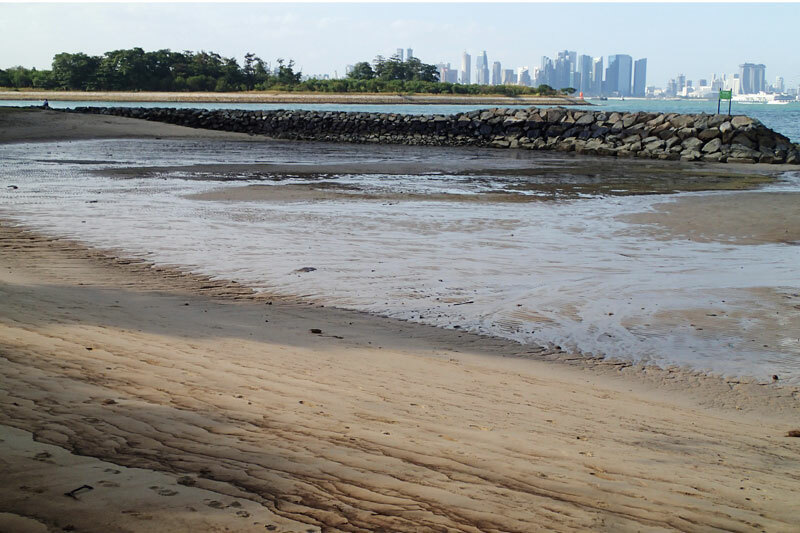 It looks like Sentosa had done a round of clean up along the high shore and this is the remaining. Oil on the sand of the high shore. As we walked down the high shore, there were still patches of oil slick. 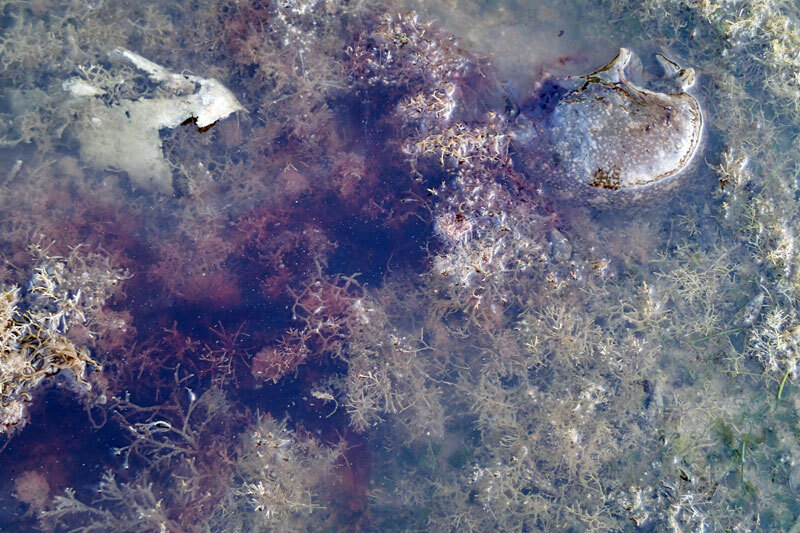 While some parts of the seagrass area had a thin layer of oil on the water, reflecting some sheen from an angle. 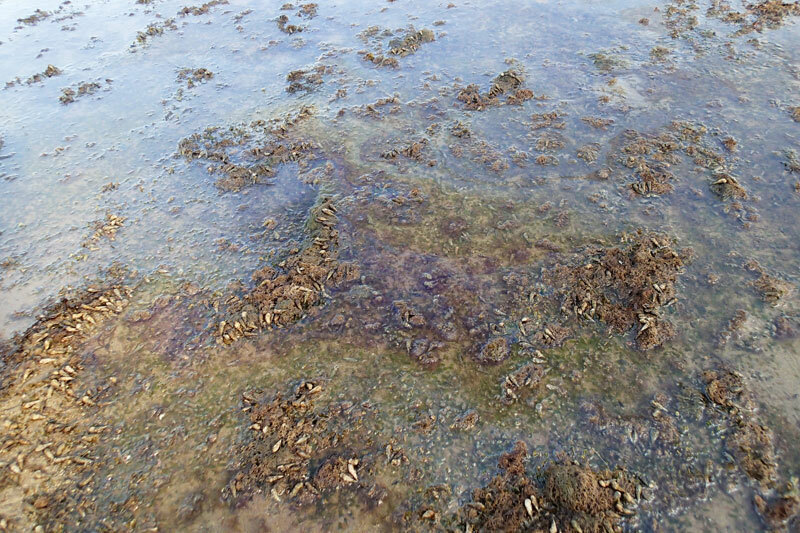 These seagrass areas are heavily covered with bazillion snails (Batillaria zonalis). Sheen on the water at some seagrass patches. 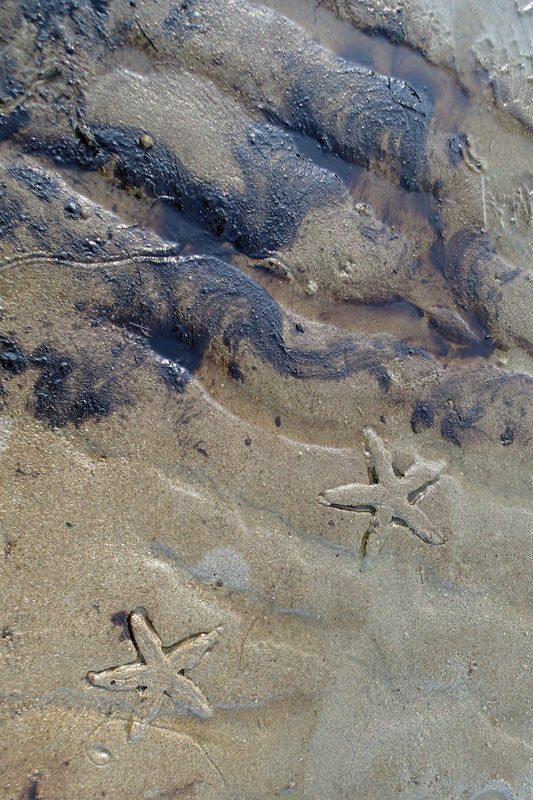 Near one of the many oil slick patches, I found a pair of common sea star (Archaster typicus). Common sea star right next to a patch of oil slick. As I got closer to the oiled seawall, the coverage of the oil got clearer. 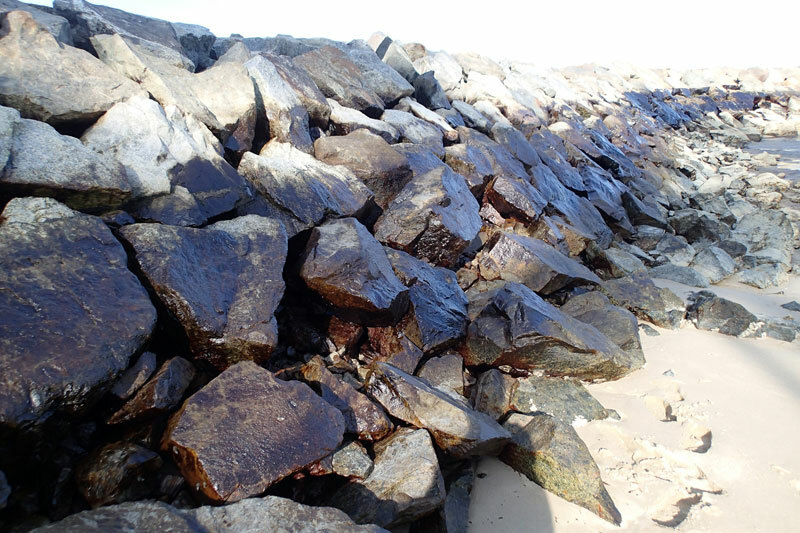 Closer image of the oil on the sea wall. 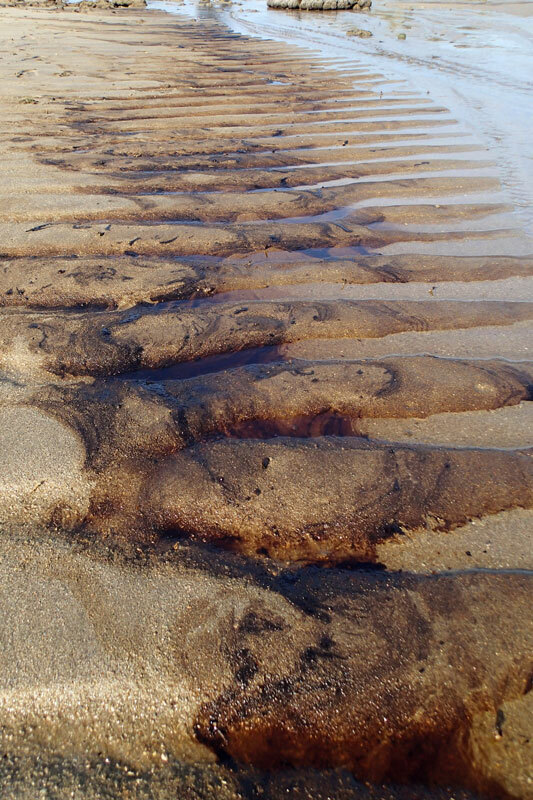 Line of oil on the sea wall from the high shore. 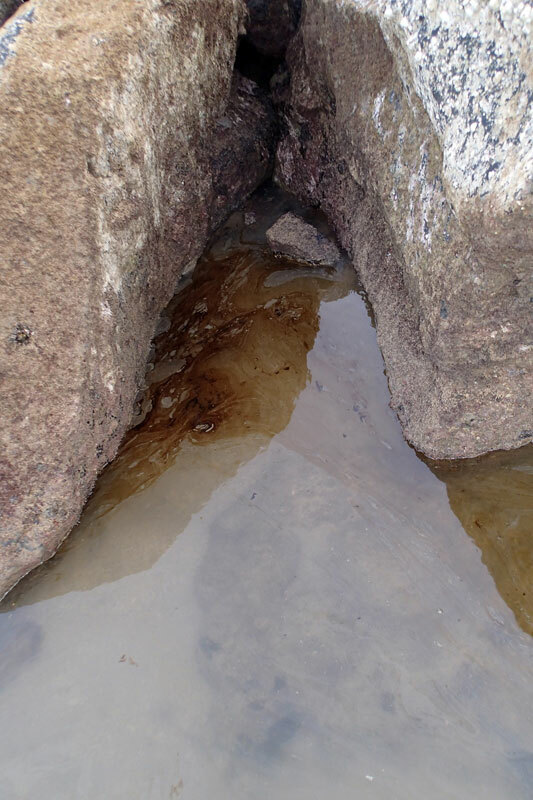 Some of the oil slick from the high shore gets slowly washed down shore by flowing streams. 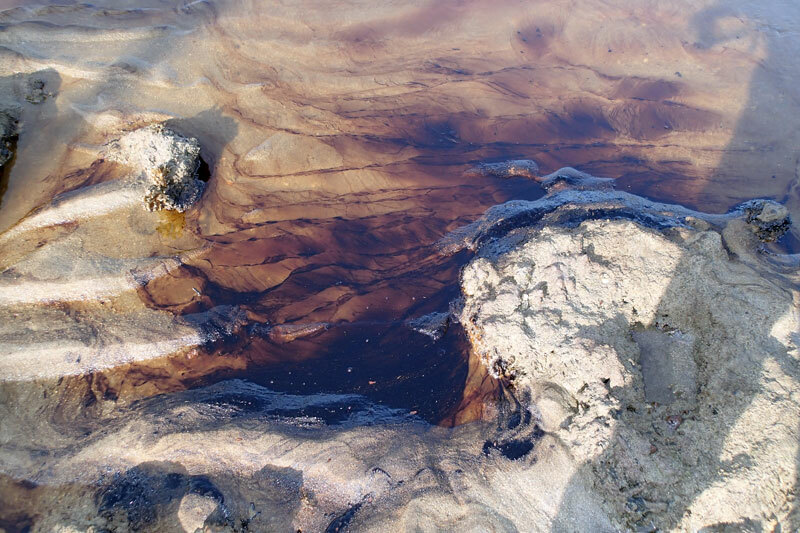 Flowing patterns of the oil at mid shore. 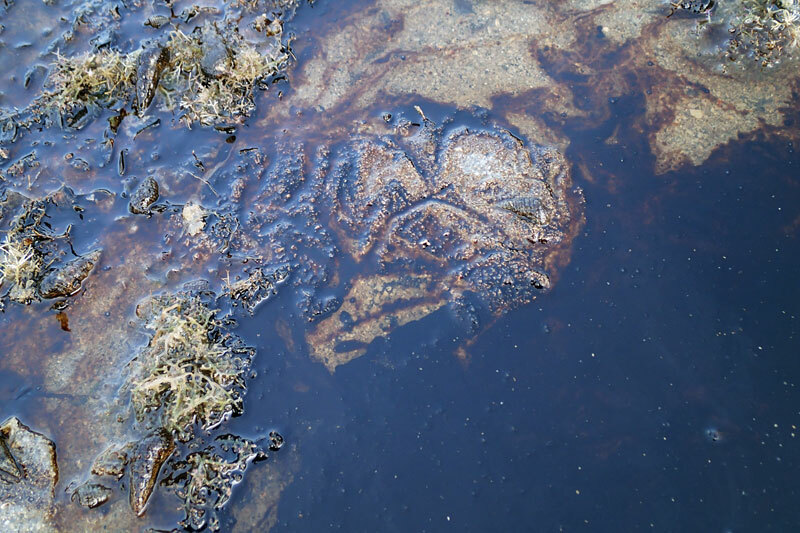 Even at the mouth of the lagoon, there were some presence of oil slick, most of which trapped in crevices of large rocks or coral colony. 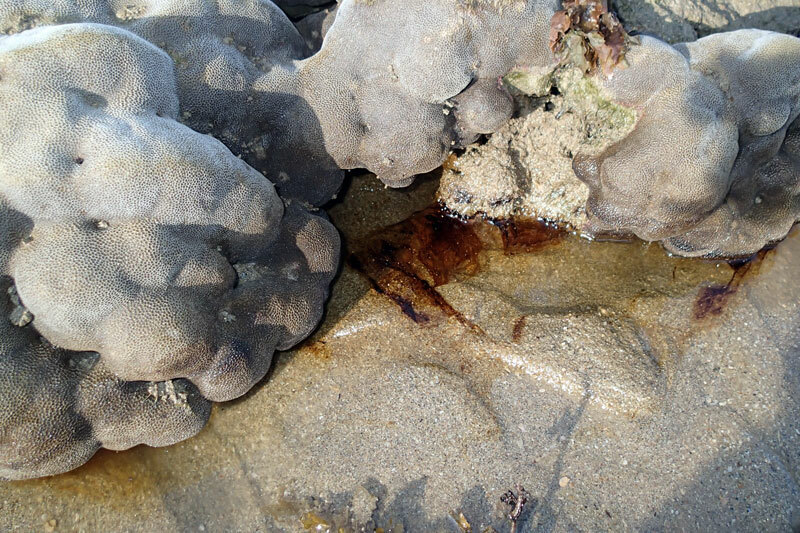 Oil trapped in coral structures. Oil slick in a small pool at the mouth of lagoon. The reefy area after the mouth of the lagoon seems much better though I can see some oil floating and moving on the water surface, especially when there are large incoming waves. The edge of the left seawall has more signs of oil as compared to whole reef. 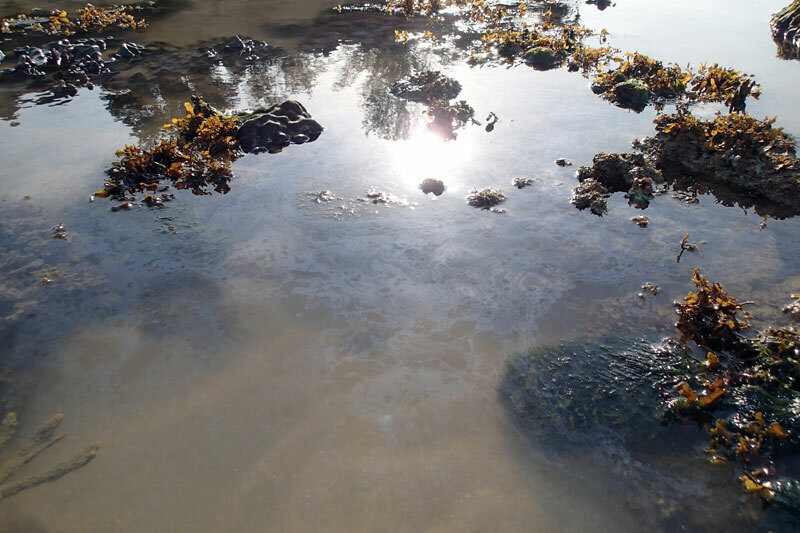 Within the lagoon, the lower shore were slightly hit by the oil spill. Most of the time, I encounter a thin layer of oil on the water surface and I only came across one patch of trapped oil slick. 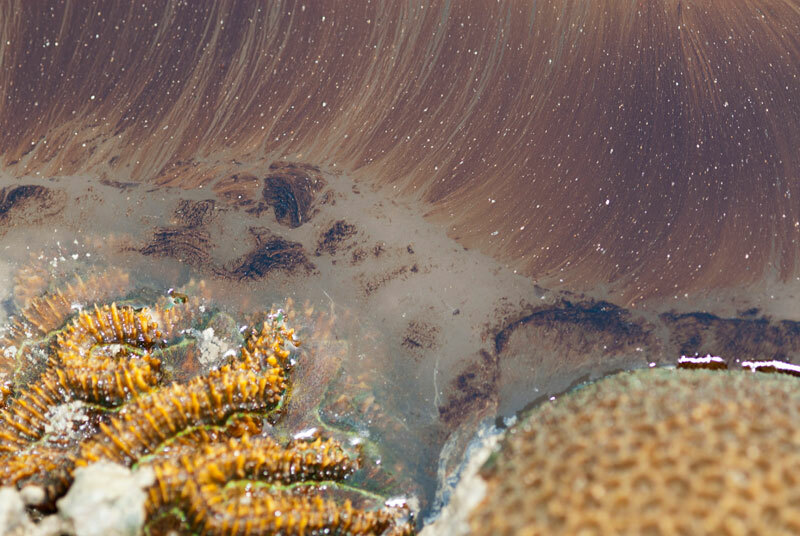 Oil slick right in between corals and an anemone. 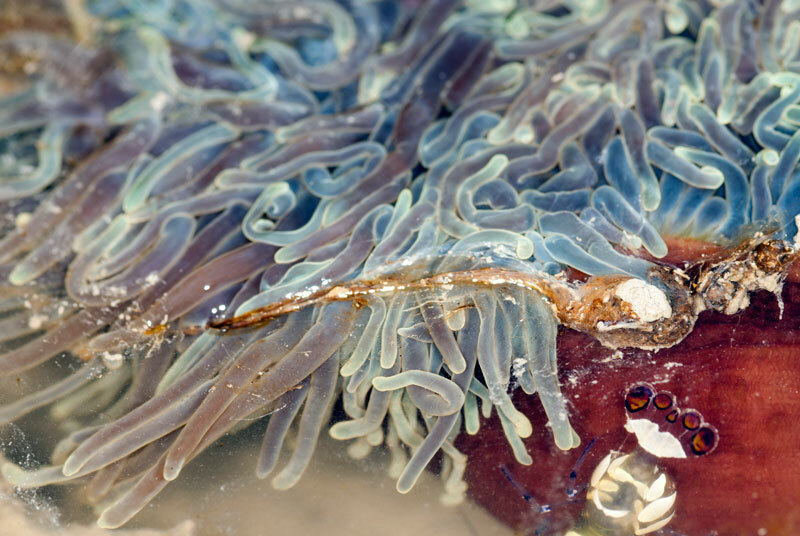 The poor giant carpet anemone (Stichodactyla gigantea) was right next to oil slick and it had a pair of five-spot anemone shrimp (Periclimenes brevicarpalis). 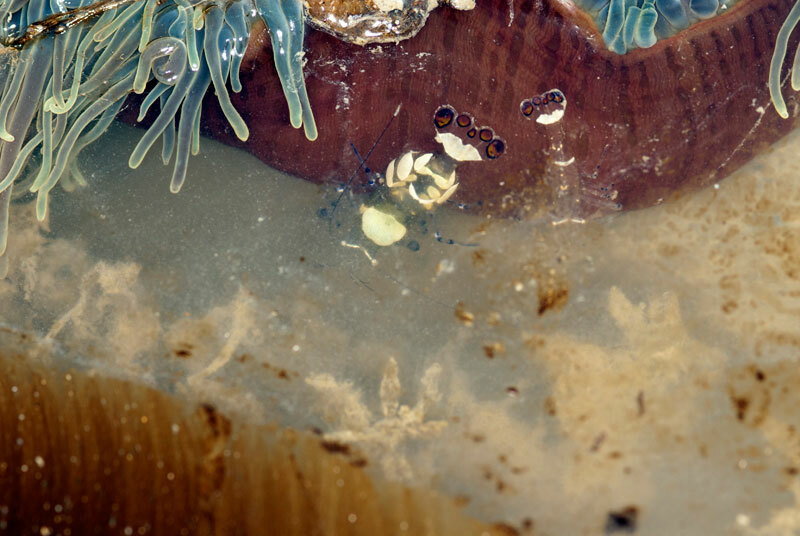 Five-spot anemone shrimp, with oil slick in the foreground. 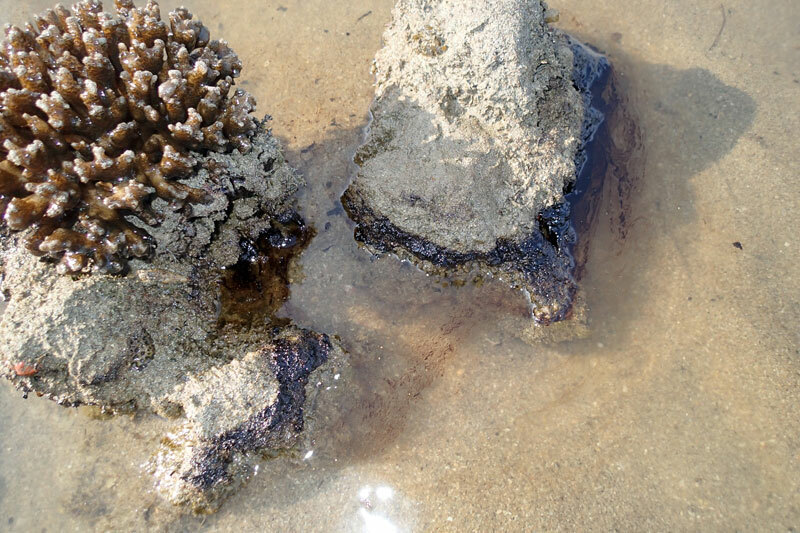 The same oil slick next to the corals. 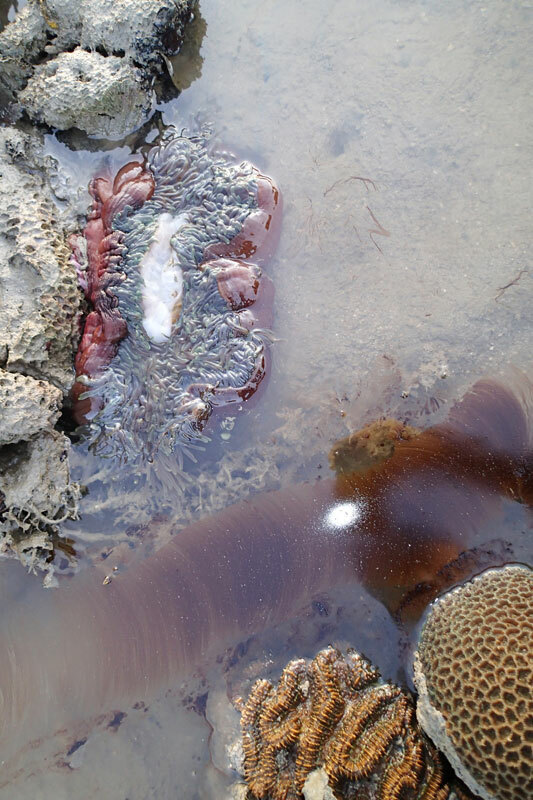 Some oil has covered a small part of the giant carpet anemone. 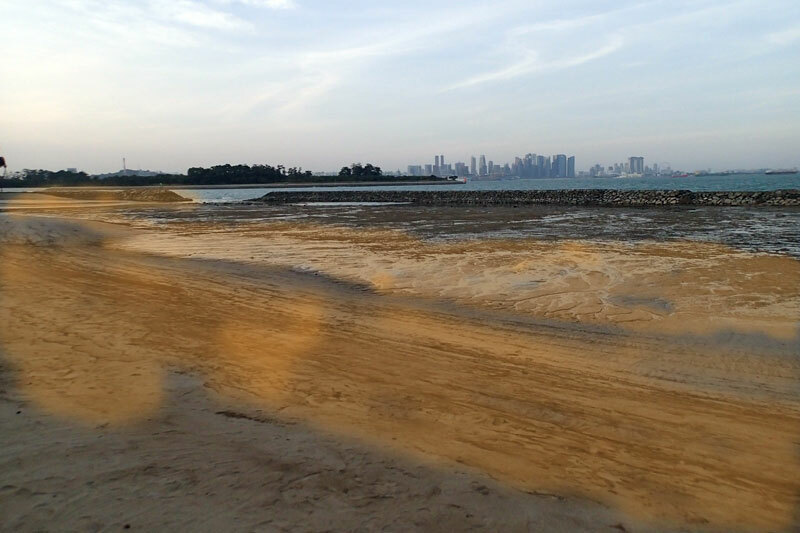 The right side of the lagoon on the high shore seems to be the most affected by the oil spill. 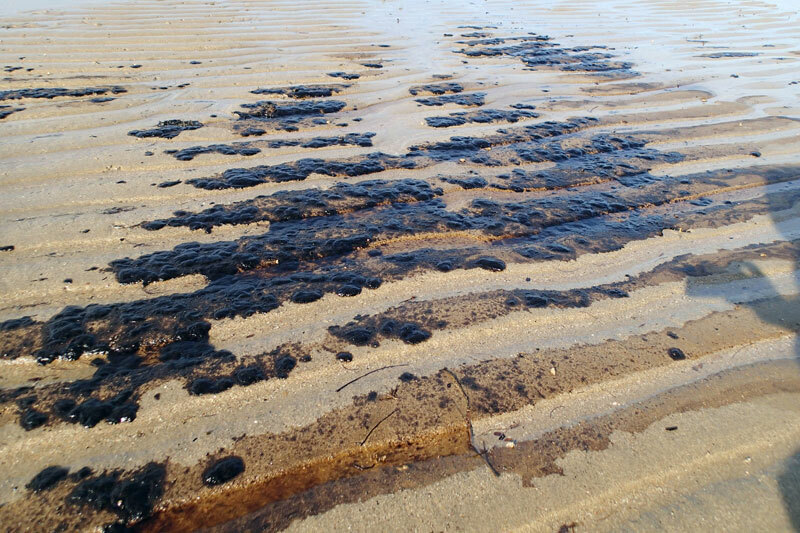 There were moving trails from the snails on the sand in the pool of black oil slick. 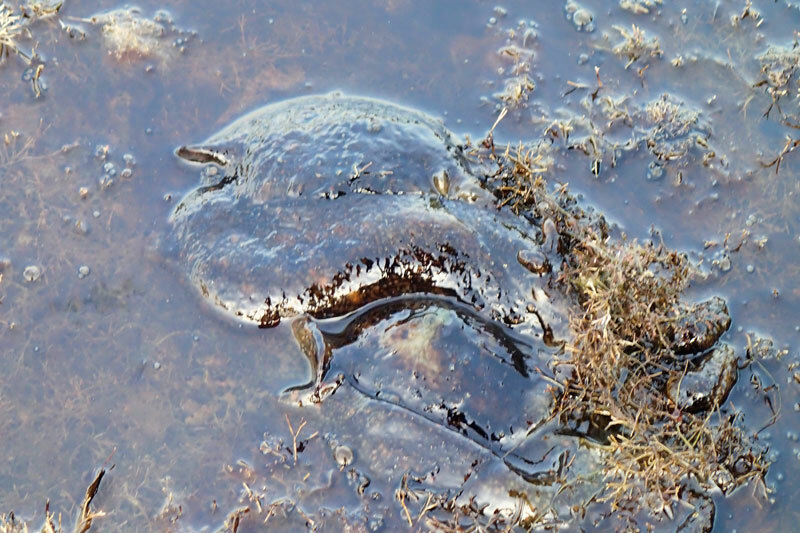 Kok Sheng came across of patch with many extraordinary sea hare (Aplysia extraordinaria) among the seagrass badly covered with oil slick. We tried to handle the sea hares only to find then very stress, as they release their purple ink immediately when touched, and very limp and soft. The sea hare were covered in oil! It was rather heartbreaking. 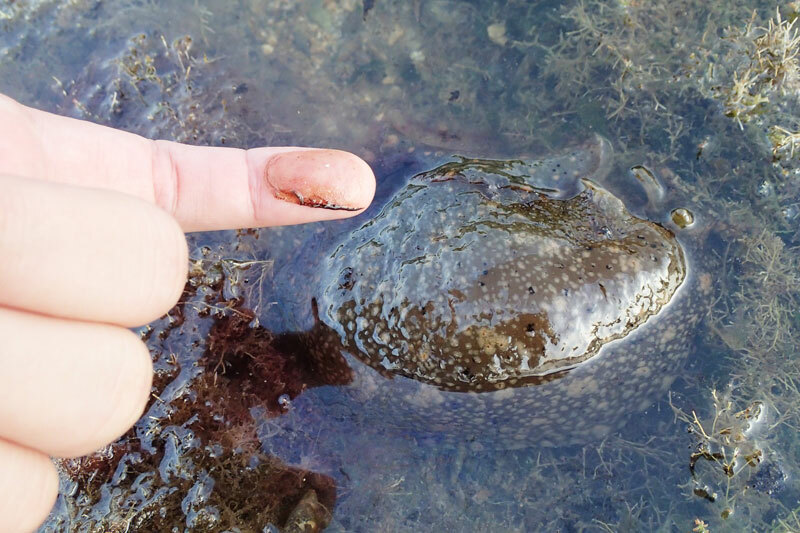 Purple ink released by the sea hare when it is stressed. Oil from running my finger gently on the animal. I also encountered a pair of sea hare "trapped" in a pool with a thick layer of oil. Can you find the sea hare? The pair of sea hare from the image above. Here's an overview picture of the lagoon affected by the oil spill. Places where we found oil in the lagoon are shaded in orange. Mostly on the high shores and left sea wall. Shading of the lagoon with traces of oil. 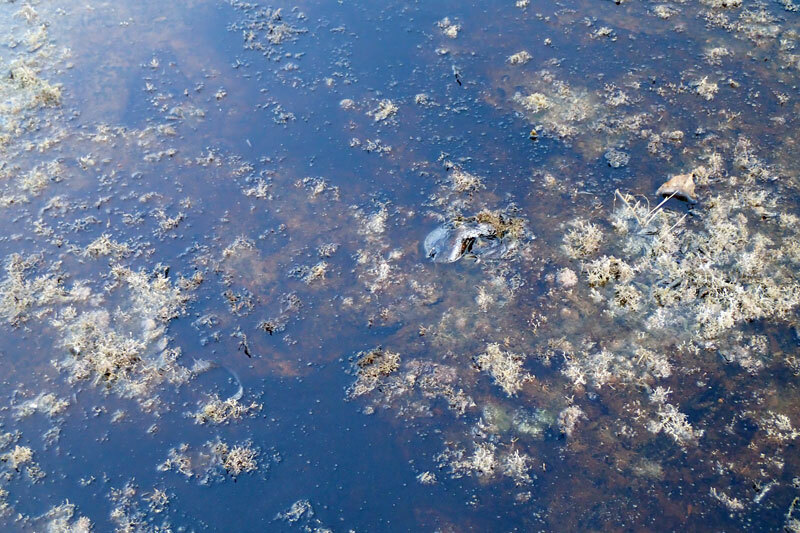 Oil spills have great effect on marine life, especially animals that need to surface to breath and also the intertidal animals. From this trip, there were already animals showing signs of stress from the oil spill, just about 1.5 days after the collision took place. The sea hares were all coated with oil and are struggling to survive. 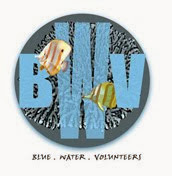 Other than marine animals living in the lagoon, other animals visit the lagoon to forage. How will the oil spill impact these visiting animals? 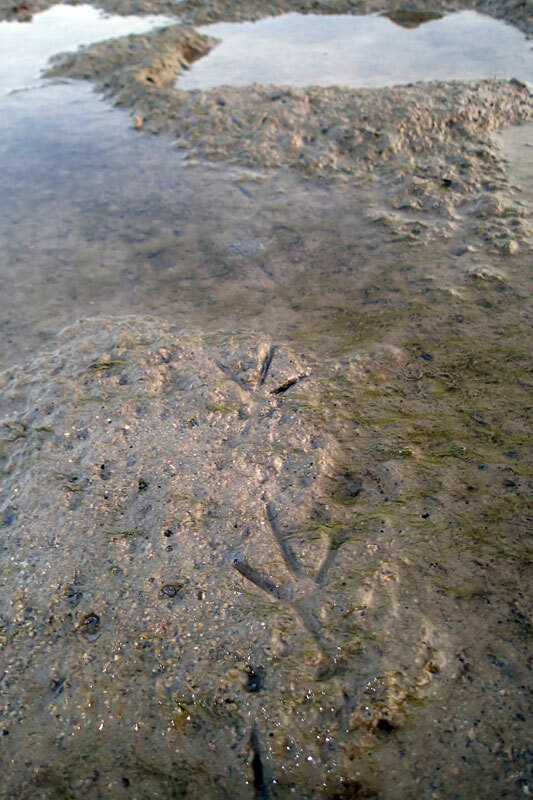 Imprint left by visiting shore bird. Here's a video montage I have complied using the photos and some videos taken during this trip to document the impact of oil spill at Kusu Island.